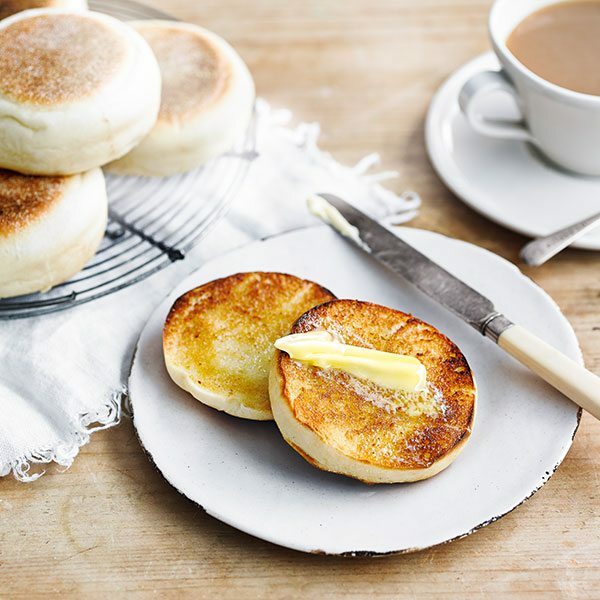 Traditional English muffins are dense, chewy and made to be toasted, then slathered in butter. Make your own using our step-by-step guide. 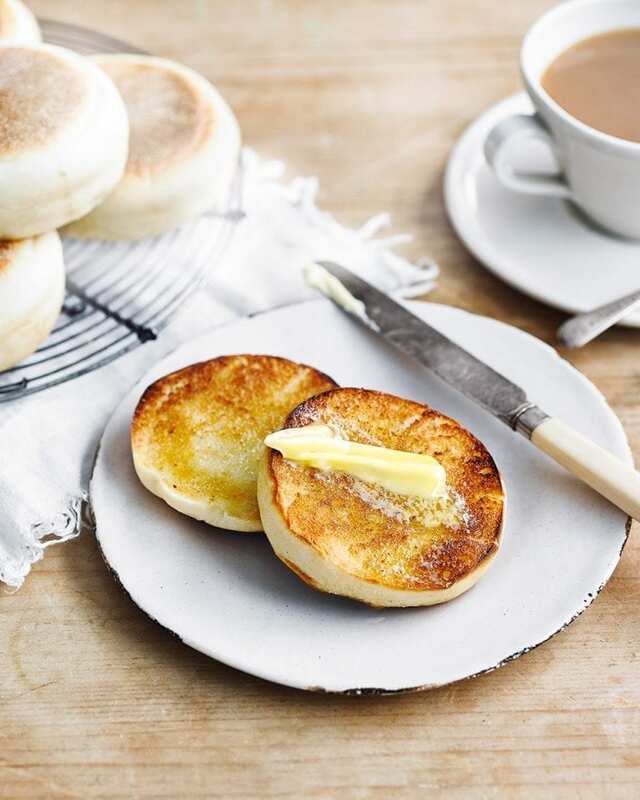 Get the full recipe for traditional English muffins here. If kneading by hand, add 250ml warm milk in step 2, and use as little flour on the surface as possible. Too much extra flour will make them hard. If you’re making the dough in a stand mixer, use 300ml milk. The softer the dough, the better. 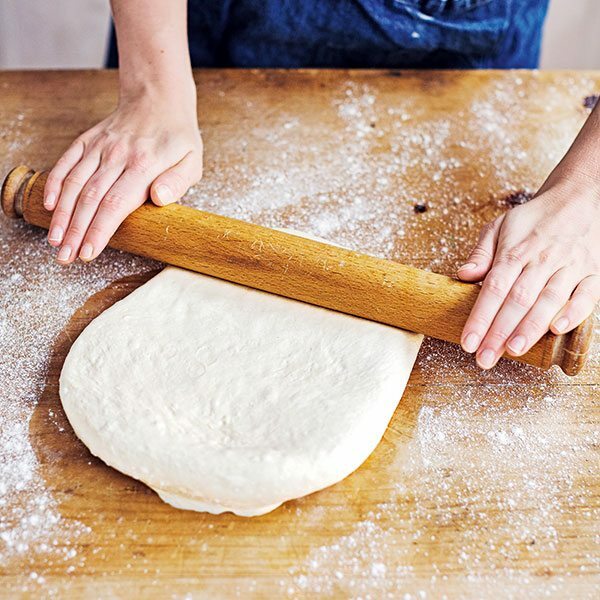 Keep the dough as soft as you can while still keeping it workable at step 2. More moisture will result in fluffier muffins – a hard, dry dough will rise less. Keep an eye on the dough while it’s rising and proving. We noticed a couple of our batches rose quite quickly, so if the dough has doubled in size before the time is up, go ahead and finish the recipe. Don’t wait for the full time. You should get 10 muffins out of the dough. If you find you have to re-roll the dough, the last couple won’t be as uniform as the first batch, but they’ll still taste good. 1. Make the starter at least 12 hours, or up to 24 hours, in advance. 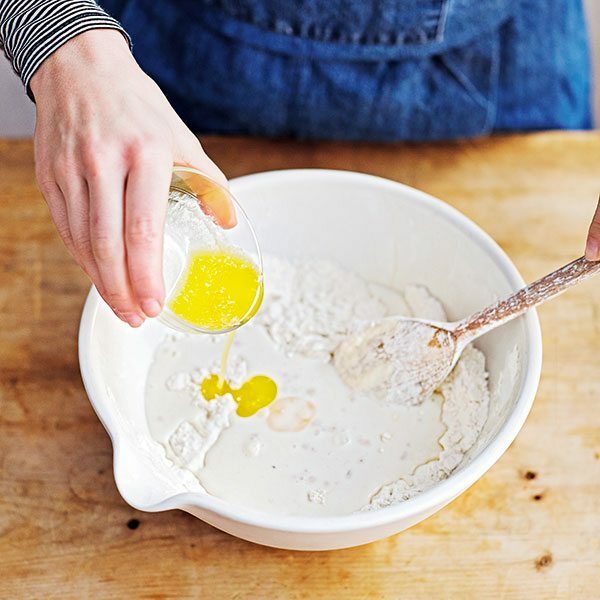 Mix the flour and yeast in a large bowl, then stir in the milk to form a thick paste. Cover with cling film and leave somewhere fairly cool (not cold) and dark (the mixture will expand a little and bubble up). To make the dough, heat the milk in a pan to just steaming. Cool to lukewarm, then stir in the yeast and set aside. 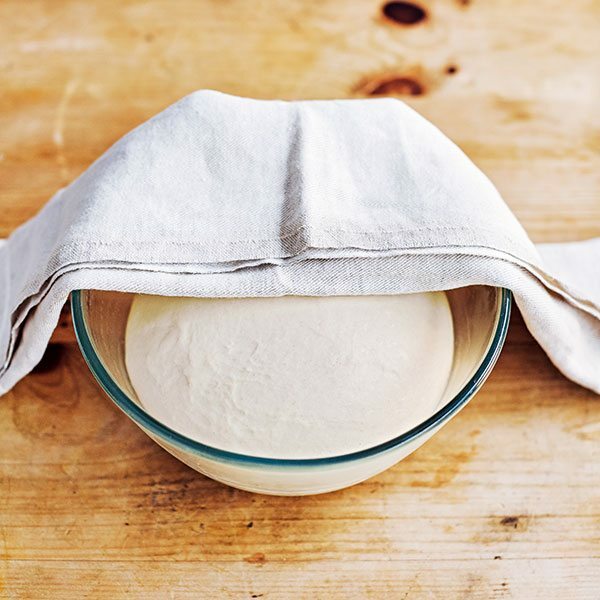 Put the strong white brea flour in a large mixing bowl with the salt and sugar, then stir in the starter. 2. By the time that’s done, the warm milk should be frothy. Add it to the bowl with the melted butter, then stir to bring it together into a dough. 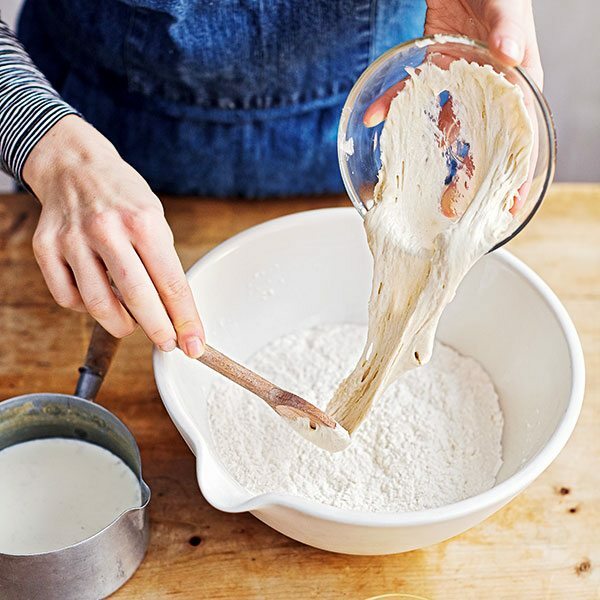 Tip out onto a very lightly floured surface and knead for 10-15 minutes until elastic and smooth (or use a stand mixer and dough hook for 8-10 minutes). 3. Transfer to a lightly oiled mixing bowl, cover with a clean tea towel and leave somewhere warm to rise until doubled in size for 1 hour (or leave overnight in the fridge). 4. 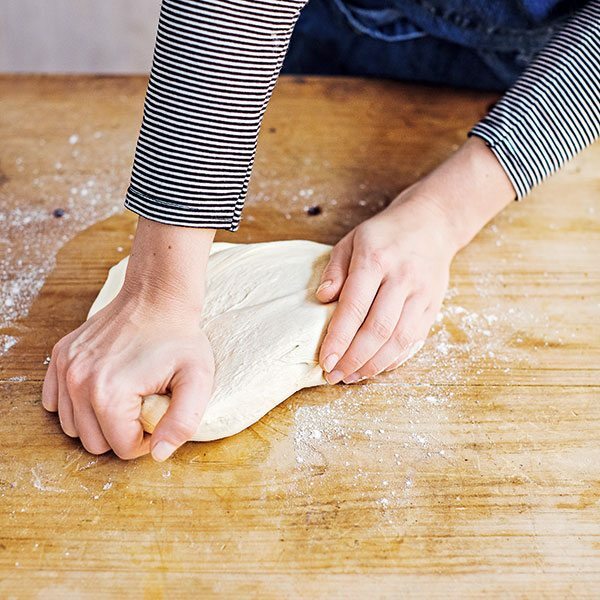 Once risen, knead the dough again on the work surface to redistribute the air bubbles (known as knocking back). 5. Roll out using a rolling pin until 2-3cm thick. 6. 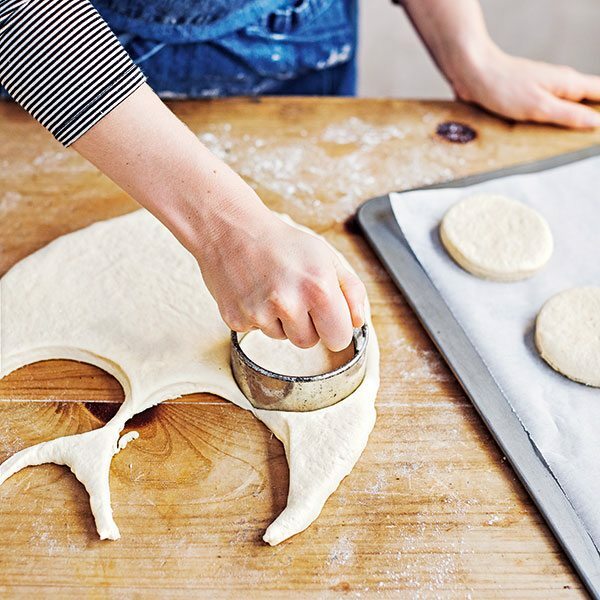 Use an 8cm round cutter to stamp out 8-10 discs from the dough, re-rolling the dough. 7. 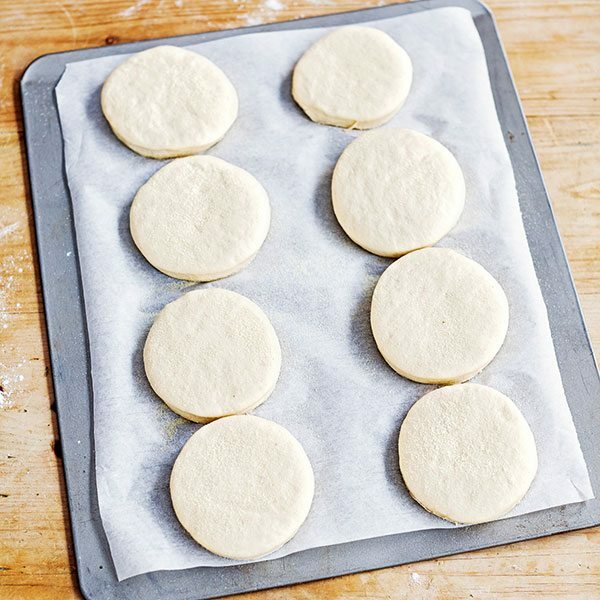 Put the discs on a piece of baking paper, scatter with a little flour and cover loosely with cling film. Leave to prove (rise) for 25-30 minutes until puffed. 8. Heat a wide, heavy-based frying pan over a medium heat and grease with a little butter. 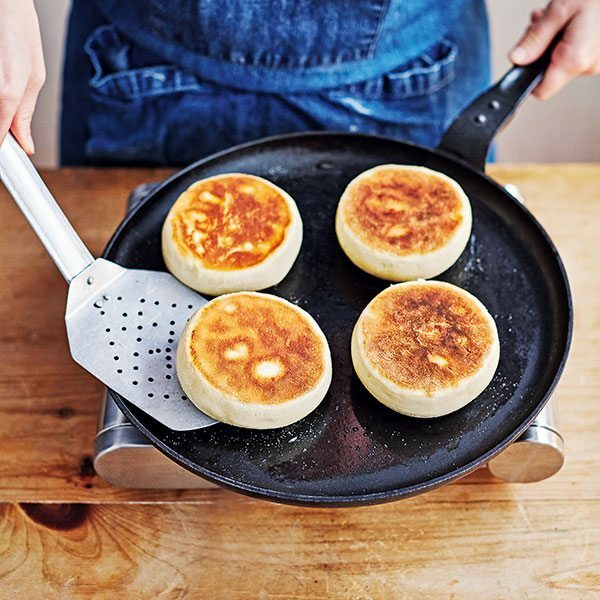 Carefully transfer 3-4 of the muffins into the pan using a fish slice, turn the heat down to low-medium and cook for 6-7 minutes, making sure they don’t burn on the underside. Once golden on the bottom and the sides are starting to look cooked, carefully flip the muffins and repeat. Transfer to a wire rack while you cook the rest. 9. Split in half, butter and eat straightaway or cool completely before toasting.